Alfonzo was mentioned alongside Derek Jeter in 2000: “Cooperstown could be their final stops.”2 He was just 27 going into the 2001 season, and it was reasonable to expect several more prime years. Yet he never produced at the same level again, owing in part to a string of injuries. His big-league career ended in 2006, but he played on in the minors, independent ball, Mexico, Japan, and his homeland as late as 2013. Alfonzo then returned to the Mets’ minor-league organization, becoming a coach and manager. Edgardo Antonio Alfonzo Pino was born on November 8, 1973 in Santa Teresa del Tuy, in the state of Miranda, southeast of Venezuela’s capital, Caracas. His parents were Edgar Alfonzo, a truck driver for a medical supply company, and Mercedes Pino, a preschool teacher. Edgardo was the youngest of four children, three of whom were sons. Baseball runs in the Alfonzo family. The oldest brother, Edgar Jr., played in the minors from 1985 through 1996, also becoming a minor-league coach and manager. Middle brother Robert (born in 1972), a Mets farmhand for 70 games in 1993 and 1994, became a scout.3 Three of Alfonzo’s nephews — Edgar Alfonzo III, Giovanny Alfonzo, and Javier Betancourt — also played in the minors and the Venezuelan winter league. A second cousin, Eliézer Alfonzo, was a big-league catcher for parts of six seasons from 2006 through 2011. Around the time Edgardo turned 11 years old, Edgar became a professional ballplayer, joining the winter league’s Caracas Leones for the 1984-85 season. 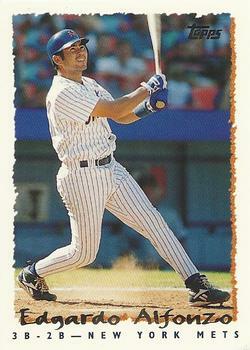 Edgardo therefore saw his first pro ballgame.7 That Leones club included various local heroes: Andrés Galarraga, Tony Armas, and Omar Vizquel (like Edgar Alfonzo, then a 17-year-old rookie). Their veteran leader was Gonzalo Márquez, who died in a tragic car accident in December 1984. Alfonzo had begun to play second base in 1994 after flashy shortstop Rey Ordóñez was promoted, so he backed up Jeff Kent there. He had also been asked to play third base that winter so Bobby Bonilla could spend more time in left field. Bonilla was traded in late July, opening up more time for the rookie. However, Alfonzo missed most of August with a herniated disc in his back. He returned in early September and finished the year hitting .278 with 4 homers and 41 RBIs in 101 games. Alfonzo posted very similar numbers (.261-4-40 in 123 games) in 1996. The Mets moved Jeff Kent to third that year and made José Vizcaino the regular second baseman, Alfonzo backing up both of them. On July 29, however, the Mets sent both Kent and Vizcaino to Cleveland in the deal that brought Carlos Baerga to New York. Baerga was a second baseman, but the Mets put him at first base and made Alfonzo the starter at second. Edgardo and Delia also welcomed their first child, Eduardo Luis, that year. The second Alfonzo son, Daniel Antonio, arrived during the 1999 season. Indeed, Alfonzo’s batting had also stepped up markedly. He set career highs in homers (27) and RBIs (108) while batting .304 and slugging .502. He won the NL’s Silver Slugger award for second basemen that year. On August 30 at the Houston Astrodome, he had the finest single game of his career, going 6-for-6 with three homers. He added a double and two singles for 16 total bases; he also scored six times. The Mets and Cincinnati Reds finished the 1999 regular season with identical records of 96-66, second in their respective divisions. There was only one wild-card playoff spot at that time, so the teams faced each other in a tiebreaker. Rickey Henderson led off the game at Cinergy Field with a single, and Alfonzo homered off Steve Parris. That was all Mets starter Al Leiter needed, as he threw a two-hit shutout. New York advanced to the NL Division Series. Alfonzo was the hitting star of Game One with two homers: a first-inning solo shot off Arizona ace Randy Johnson and the game-winning grand slam in the top of the ninth off Bobby Chouinard. He also homered in the decisive Game Four, which sent New York into the NL Championship Series against Atlanta. Alfonzo went 6-for-27 with four doubles as the Mets lost to the Braves in six games. When the Mets defeated the St. Louis Cardinals to win the NL pennant in 2000, Alfonzo insisted that his brother Edgar be in the clubhouse to join in the celebration. They shared a bottle of champagne, hugging and crying joyfully together.28 The New York Yankees beat the Mets in five games in the World Series, though, and Alfonzo managed just 3 hits in 21 at-bats. Despite the down year, in spring 2002 the Mets offered Alfonzo a three-year contract extension worth $18 million, which he turned down.30 His average rebounded (.308), but his homer and RBI totals (16 and 56) were still well below his peak. His left hand bothered him for much of the early season after he dove for a ball.31 He also spent time on the disabled list again, this time with a strained oblique muscle in August. The 2002 season also featured a return to third base, since the Mets had traded Robin Ventura and acquired Roberto Alomar to play second. Alfonzo became a free agent that fall. He very much wanted to stay in New York, which had become home, and would have for a two-year contract worth $17 million. However, the Mets’ best offer was two years for $11 million. As it turned out, he got a longer contract with bigger money from the San Francisco Giants: a four-year, $26 million deal, topping offers from the A’s and Padres.32 Meanwhile, the Mets unsuccessfully wooed Japanese third baseman Norihiro Nakamura (who flopped after signing with the Dodgers in 2005). Alfonzo replaced departed free agent David Bell at third base in San Francisco.34 His first year there was solid but unspectacular: .259 with 13 homers and 81 RBIs in 142 games. He struggled in the first half but picked up as the season progressed. The Giants won the NL West that year but got knocked out in the Division Series by the eventual World Series champs, the Florida Marlins. Alfonzo, however, had an excellent NLDS: 9-for-17 with four doubles. The 2004 season was fairly similar for Alfonzo, with a .289 average, 11 homers and 77 RBIs. Again he got off to a slow start, this time because of a hamstring pull in spring training.35 He warmed up in May, though, and hit more consistently throughout the year. In March 2006, Alfonzo represented his homeland in the World Baseball Classic. He hit 5-for-16 with a homer and two RBIs in five games, but Venezuela was eliminated in the second round. Alfonzo’s next stop was independent ball. He signed with the Bridgeport Bluefish of the Atlantic League. After just four games with the Bluefish, the Mets gave him another chance, assigning him to their top farm club, Norfolk in the International League. Mets special assistant Tony Bernazard said that Fonzie would play all over the infield and that bringing him back to New York was “part of the equation.”42 However, Alfonzo hit just .241 with 3 homers and 19 RBIs in 42 games and was not called up. He was granted free agency that October. At this juncture in Alfonzo’s career, the Venezuelan league gained renewed importance for him. For much of his big-league prime, his action at home was minimal, first because the Mets were concerned about injury risk and later because he stayed in the U.S. for off-season training.43 He appeared in just eight games for Magallanes in the six seasons from 1998-99 through 2003-04, and 33 in the two winters after that. In 2006-07, though, he got into 32 games. It didn’t work out that way, though, since Alfonzo’s play was reasonably solid but not eye-catching. He returned to his original position, playing 62 games at shortstop, as well as 25 at third. In 105 games overall, he hit .266 with 5 homers and 56 RBIs. During the winter of 2007-08, Alfonzo played 54 games for Magallanes. He showed that he could still be productive, hitting .335 with 5 homers and 33 RBIs. That earned him a minor-league contract and an invitation to spring training from the Texas Rangers. However, the Rangers released him in late March. Alfonzo signed with Tigres de Quintana Roo in the Mexican League and played 55 games in that circuit. He returned to the Long Island Ducks in June and hit well (.329 with 8 homers and 27 RBIs in 59 games). The 2008-09 season was Alfonzo’s best at home. He hit .320, and his 8 homers and 42 RBIs were both winter-career highs. As a result, Japan’s most prominent franchise, the Yomiuri Giants, gave him a tryout at their spring training camp. It went well enough that he signed a one-year contract for $380,000. Alfonzo called it an honor to be with the Giants and said he’d play his hardest to contribute.45 He remembered playing Opening Day 2000 with the Mets in Tokyo and was happy to return. Although he got into just 21 games for Yomiuri, with merely 6 hits in 41 at-bats, his experience was positive. He said Yomiuri treated him very well and politely, recognizing his work with the Mets.46 The Giants won the Japan Series in 2009, but if Alfonzo made it to the postseason roster, he did not appear in any games. Alfonzo still thought he had two or three years of baseball left in him, and went back to Venezuela in hopes of getting another invitation to a big-league camp. His strong preference was for another chance with the Mets, since he still felt loyal toward the team and its fans.47 After 18 games with Magallanes in 2009-10, Alfonzo gave it a last shot in the Atlantic League in 2010. The Newark Bears, managed by Tim Raines, signed Alfonzo and his old Mets teammate Armando Benitez that March.48 In 26 games with the Bears, he went 12-for-78. Following that stint, Alfonzo’s remaining playing days came at home. In the winter of 2011-12, after 15 seasons with Magallanes, he moved to a new club, Tigres de Aragua. He played his last 15 games for Aragua in the 2012-13 season. All told, he hit .293 in 594 regular-season games in his homeland, with 28 homers and 244 RBIs. He appeared 13 times in the Venezuelan postseason and was a member of five championship teams. Three of those were with Magallanes (1993-94, 1995-96, and 1996-97). The other two came with Aragua (2007-08, as a playoff reinforcement, and 2011-12). A few weeks earlier, Alfonzo was asked about becoming a big-league manager someday. He replied that he too was still in the process of learning and getting to know the game more.53 He reiterated in March 2018 that he didn’t have the mindset yet and that he needed more experience; coaching in the big leagues was an attractive prospect.54 In his second year, Brooklyn posted a much-improved record of 40-35. 1 Jack Curry, “The Anonymous Alfonzo,” New York Times, August 27, 1999, D3. 2 Andrew Marchand, “Amazin’ Alfonzo a Pro’s Pro,” New York Post, June 8, 2000 (https://nypost.com/2000/06/08/amazin-alfonzo-a-pros-pro/). 3 Buster Olney, “Lessons of a Sibling Rivalry,” New York Times, January 14, 1998, C1. The mother’s name was shown as “Mercedes Porfiria” in Thomas Hill, “Serious Biz for Fonz,” New York Daily News, January 18, 1998 (http://www.nydailynews.com/archives/sports/serious-biz-fonz-mets-alfonzo...). Porfiria is most likely her middle name. The fourth Alfonzo sibling is confirmed to be a sister in Alexander Mendoza, “Javier Betancourt Valora la Experiencia con Leones,” LVBP.com, January 12, 2015 (https://www.lvbp.com/2062_javier-betancourt-valora-la-experiencia-con-le...). Research has not yet uncovered her name. 4 Henry Schulman, “Bond of brothers,” SFGate.com, March 2, 2003 (https://www.sfgate.com/sports/article/Bond-of-brothers-Giants-Alfonzo-sh...). 8 Jon Springer and Matthew Silverman, Mets by the Numbers, New York: Sports Publishing (2008). 9 Matthew Brownstein, “MMO Exclusive: Mets Great, Edgardo Alfonzo,” MetsMerizedOnline.com, April 20, 2018 (https://metsmerizedonline.com/2018/04/mmo-exclusive-mets-great-edgardo-a...). 16 Jennifer Frey, “Mets Prospect Stuck on Long Honeymoon,” New York Times, February 22, 1995, B11. 20 Marty Noble, “Fonzie: Voters Made Gold Glove Error,” Newsday (Melville, New York), November 10, 1999 (https://www.newsday.com/sports/fonzie-voters-made-gold-glove-error-1.314426). Ken Caminiti won the NL Gold Glove at third base in 1997 and Scott Rolen in 1998. 21 “Alfonzo Signs 4-Yrs with Mets,” CBSNews.com, February 5, 1999 (https://www.cbsnews.com/news/alfonzo-signs-4-yrs-with-mets/). 22 Tom Verducci, “Glove Affair,” Sports Illustrated, September 6, 1999 (https://www.si.com/vault/1999/09/06/8110328/glove-affair-a-new-man-at-th...). The Mets gave up just 20 unearned runs overall in 1999. 24 David Waldstein, “Alfonzo Earning Title of ‘Mr. Clutch,’” New York Post, July 5, 1999 (https://nypost.com/1999/07/05/alfonzo-earning-title-of-mr-clutch/). 26 Marchand, “Amazin’ Alfonzo a Pro’s Pro.” Cincinnati’s Pokey Reese won the NL Gold Glove at second base in both 1999 and 2000. 27 Tyler Kepner, “When It Matters Most, Alfonzo Is the Mightiest Met,” New York Times, October 14, 2000, D1. 29 Tom Keegan, “Fonzie: I’ll Be a Star Again,” New York Post, August 22, 2001 (https://nypost.com/2001/08/22/fonzie-ill-be-a-star-again/). 30 John Harper, “The Art of the Deal,” New York Daily News, December 22, 2002 (http://www.nydailynews.com/archives/sports/art-deal-edgardo-alfonzo-new-...). 31 Michael Morrissey, “Healthy Alfonzo Starting to Find Power,” New York Post, June 9, 2002 (https://nypost.com/2002/06/09/healthy-alfonzo-starting-to-find-power/). 33 “Fonzie’s Swan Song,” Adweek, February 20, 2003 (https://www.adweek.com/brand-marketing/fonzies-swan-song-61976/). 34 Jeff Kent, San Francisco’s star second baseman for the previous six years, had also left as a free agent. But the Giants signed Ray Durham to fill that hole, precluding another position switch for Alfonzo. 35 Glenn Reeves, “Alfonzo’s slump is a cause for concern,” East Bay Times, April 21, 2004 (https://www.eastbaytimes.com/2004/04/21/alfonzos-slump-is-a-cause-for-co...). 36 Bill Shaikin, “Alfonzo Wants Regular Playing Time,” Los Angeles Times, March 20, 2006 (http://articles.latimes.com/2006/mar/20/sports/sp-angrep20). 37 Susan Slusser, “Giants Get Finley — Alfonzo to Angels,” SFGate.com, December 22, 2005 (https://www.sfgate.com/sports/article/Giants-get-Finley-Alfonzo-to-Angel...). 39 Bill Shaikin, “Alfonzo Is Released; Jason] Bulger Is Called Up,” Los Angeles Times, May 21, 2006 (http://articles.latimes.com/2006/may/21/sports/sp-angrep21). 41 “Blue Jays activate McDonald, recall Russ] Adams, release Alfonzo and outright Luis] Figueroa,” ESPN.com, June 12, 2006 (http://webcache.googleusercontent.com/search?q=cache:LvaPnyiIE84J:www.es...). 42 Mark Hale, “Happy Days: Mets Welcome Back Fonzie,” New York Post, July 16, 2006 (https://nypost.com/2006/07/16/pedro-in-hospital-happy-days-mets-welcome-...). 44 Jeff Pearlman, “These Ducks are waiting for ‘the call,’” ESPN.com, June 22, 2007 (http://www.espn.com/espn/page2/story?page=pearlman/070621). 45 “Yomiuri Giants give Alfonzo 1-year deal,” ESPN.com, February 9, 2009 (http://www.espn.com.au/mlb/news/story?id=3894804). 46 Kevin Kernan, “Alfonzo yearns for one more Amazin’ shot,” New York Post, November 14, 2009 (https://nypost.com/2009/11/14/alfonzo-yearns-for-one-more-amazin-shot/). 48 Josh Levitt, “Armando Benitez and Edgardo Alfonzo Back Together Again,” BleacherReport.com, March 26, 2010 (https://bleacherreport.com/articles/369265-armando-benitez-and-edgardo-a...). 49 Anthony DiComo, “Franchise favorite Alfonzo to manage Brooklyn,” MLB.com, January 5, 2017 (https://www.mlb.com/news/edgardo-alfonzo-to-manage-brooklyn-cyclones/c-2...). 50 Laura Amato, “Commodores standout opting for college route,” TimesLedger (Queens, NY), June 23, 2017 (https://www.timesledger.com/stories/2017/24/alfonzobase_2017_06_23_q.html). 51 Edgar Alfonzo also managed the Cyclones in 2007 and 2008. 52 Matthew John, “Edgardo Alfonzo making most of first season as Cyclones skipper,” TimesLedger, August 19, 2017 (https://www.timesledger.com/stories/2017/33/edgardoalfonzo_2017_08_18_q....). 53 Jordan Lauterbach, “Ex-Met Edgardo Alfonzo managing Brooklyn Cyclones,” Newsday, July 21, 2017 (https://www.newsday.com/sports/baseball/mets/ex-met-edgardo-alfonzo-mana...).